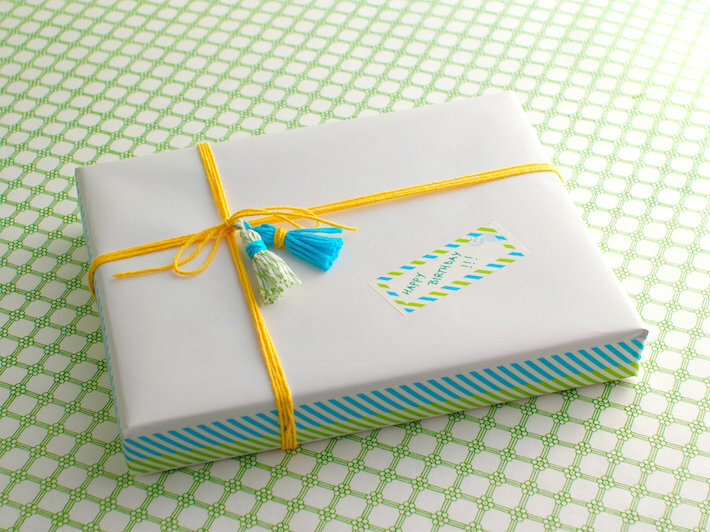 Giftwrapping expert Corinna vanGerwen is joining us today with a fun way to wrap it pretty! Looking for a fresh way to wrap your next gift? Try a fun combo of twine and washi tape. To wrap this gift, I started by creating some tiny tassels using a selection of the Divine Twine Fresh Colour Collection and the Divine Twine Solid Colour Collection. Tassels are pretty easy to make — Google to find instructions (I modified the steps of this tutorial). After wrapping my gift in glossy, white paper, I dressed it up with the Blue & Green Gift Washi Tape Set — I used the stripes tape along the edges of the box, and added a label from the roll of labels (the roll has so many cute options on it!). Next, I wound Divine Twine in yellow around the box four times (to add bulk and more colour), then attached the two tiny tassels to the bow. Twine and washi tape together really make gift wrapping much cooler, I have to say. Either one is good, but using them both together is really awesome.